Background and study aims: Biliary stent dysfunction is mainly caused by biliary sludge that forms as a result of bacterial adherence and subsequent biofilm formation on the inner surface of the stent. Silver ions arewell known to have excellent antimicrobial activity against a wide range of microorganisms. 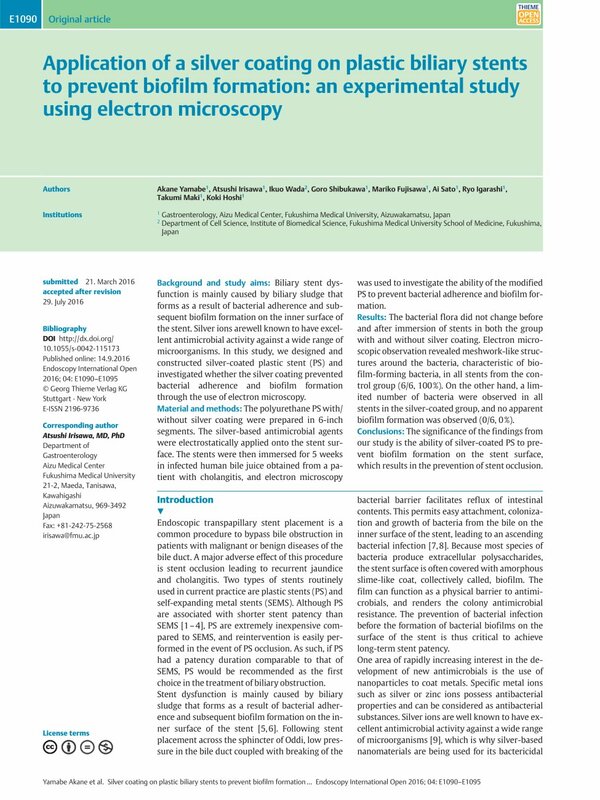 In this study, we designed and constructed silver-coated plastic stent (PS) and investigated whether the silver coating prevented bacterial adherence and biofilm formation through the use of electron microscopy. Material and methods: The polyurethane PS with/without silver coating were prepared in 6-inch segments. The silver-based antimicrobial agents were electrostatically applied onto the stent surface. The stents were then immersed for 5 weeks in infected human bile juice obtained from a patient with cholangitis, and electron microscopy was used to investigate the ability of the modified PS to prevent bacterial adherence and biofilm formation. Results: The bacterial flora did not change before and after immersion of stents in both the group with and without silver coating. Electron microscopic observation revealed meshwork-like structures around the bacteria, characteristic of biofilm-forming bacteria, in all stents from the control group (6/6, 100 %). On the other hand, a limited number of bacteria were observed in all stents in the silver-coated group, and no apparent biofilm formation was observed (0/6, 0 %). Conclusions: The significance of the findings from our study is the ability of silver-coated PS to prevent biofilm formation on the stent surface, which results in the prevention of stent occlusion.